There are a lot of historical episodes and phenomena that are interpreted and presented differently by different sources. However, there are events that all parties prefer to forget. The massacre of Russian soldiers by Caucasian Turks (also referred to as Transcaucasian Tatars, the ancestors of Azerbaijanis) in Shamkhor in 1918 is one of such events. PanARMENIAN.Net - PanARMENIAN.Net presents the details of the Shamkhor massacre. After the 1917 revolution and Bolsheviks’ coming to power in Russia, Armenians and Georgians in the South Caucasus were on the way of state formation, while Turkic groups living there were going to become a nation. Russia and Ottoman Turkey’s territorial claims caused more and more problems, paving way for a number of dramatic events, specifically the violence against Armenians and Russians in Baku and Elizavetpol provinces. In late 1917 and at the beginning of the next year, Turkey, taking advantage of the chaos reigning in Russia, started propagandizing Panturkism with the help Caucasian Turks՛ Musavat party. Georgian Mensheviks, who closely collaborated with Musavat party members, had influence in Tbilisi and Transcaucasian commissariat (the chief land authority), while Russian Bolsheviks relied on the soviet government in Baku headed by Stepan Shahumyan. Each side needed to strengthen positions, specifically to reinforce the military. 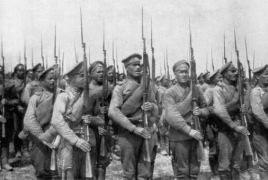 In 1917, as result of policy pursued by Bolshevik Russia, the remaining Russian troops in Turkey started losing ground. According to a ceasefire agreement signed in Yerznka (Turkish: Erzincan) on December 5, the Russians started returning home. However, just at that time Caucasian Tatars with the consent of the Turkish army organized attacks on the trains transporting the Russian soldiers. The Georgian leaders of the Transcaucasian commissariat and the local Council of Workers' and Soldiers' Delegates were also interested in such assaults, as they strived to hamper Bolsheviks՛ plans to mend their fences with the help of the retreating Russian soldiers, who moved towards Baku. The matter concerns the armored train sent by order of the head of territorial committee, Menshevik Noy Zhordania with a purpose to provide the local Muslims with arms. The telegram offering to “take advantage of the passing by train” proves the fact. From January 8-13, 1918, about 2,000 Russian soldiers were massacred in the environs of Elizavetpol and Shamkhor, as well as at Aghstafa, Dollyar, Julfa, Evlakh and Khachmas stations. Around 15,000 rifles, 20 cannons (according to some other sources 12) and 70 machine guns were seized. The other soldiers managed to reach Baku after weeks of heavy fighting. Witnesses Stanislav Edievsky’s memoir titled “The Tragedy of Shamkhor” was published on January 31 in Baku newspaper. According to him, before reaching Shamkhor, the Muslims ordered the Russian soldiers to hand in arms, threatening to seize them anyway. After the soldiers refused, Tatars attacked them. After several hundreds of soldiers were killed, the Russians finally agreed to give the arms; however, this did not save them from further massacre committed by an armed Muslim mob and the so-called “wild division” of Tatars led by Georgian commander Levan Maghalov. It should also be noted that those responsible for the massacre, namely A. Ziatkhanov, A.-bek Safikyurduski, L. Maghalov, M.-bek Rustambekov, A.-bek Khasmamedov and some others participated in the killings of Armenians during Armenian-Tatar clashes in 1905–1907. The masterminds of the Russian “disarmament” plan, Zhordania and Ramishvili, denied any accomplice in the massacre and put the blame on the “insufficiency” of the Transcaucasian central government and polyarchy. Besides, after the railway communication between Tbilisi and Baku was suspended, thousands of Armenian soldiers, who were supposed to participate in the defense of Caucasian front, remained stranded in Baku. Finally, a reserve Armenian regiment and a battalion consisting of 3,000 Armenian volunteers were formed. V. Melikyan, The events in Elizavetpol and Shamkhor in the contest of Transcaucasian authority issue, November 1917 – February 1918. Massacre of Armenians in Baku and Elizavetpol in 1918-1920 (collection of documents), Yerevan, 2013.